Thanksgiving. In the general American consciousness, it is a holiday for feasting, celebrating one’s family (or close network of friends who might as well be family), and pondering all that is good in our lives. The focus is typically on the grand turkey dinner—but most people don’t fast all day before they eat. So what are you going to munch on while you prepare your dinner, or before you go pick it up from the store, as the case may be? The answer had better be a delicious cheese plate. After all, there can be no feasting and no celebrating—no party!—without cheese. While it might seem really easy to just call up your cheesemonger and arrange for her or him to prepare something for you, that robs you of half the fun. Plus it can be really stressful for a cheesemonger when you call, demand a cheese plate, and have no idea what you like or what you want on that plate. We all have different tastes, preferences, and ideas about what is good. So I’m going to provide you with some rudimentary tools for putting together your own cheese plate this Thanksgiving. You can do some research and make your own firm decisions about what to eat, or you can go in to your local cheese shop with an informed mind and work together with your cheesemonger to plan a truly special platter. But first, I’m going to make you think deeply about what you’re doing by creating a cheese plate. Then we’ll get to the fun stuff. In his book “Cheese Primer,” Steven Jenkins outlines his theory by drawing the difference between a cheese board (a bunch of random cheeses laid out on the same plate with no thought to how they might go together other than that you like them for what they are) and a cheese plate, which he imagines more formally—with no more than three or four cheeses, each cheese on its own separate plate, basic accompaniments like bread and a carefully chosen wine, and extraordinary care given to the types of cheeses you will taste (page 26). 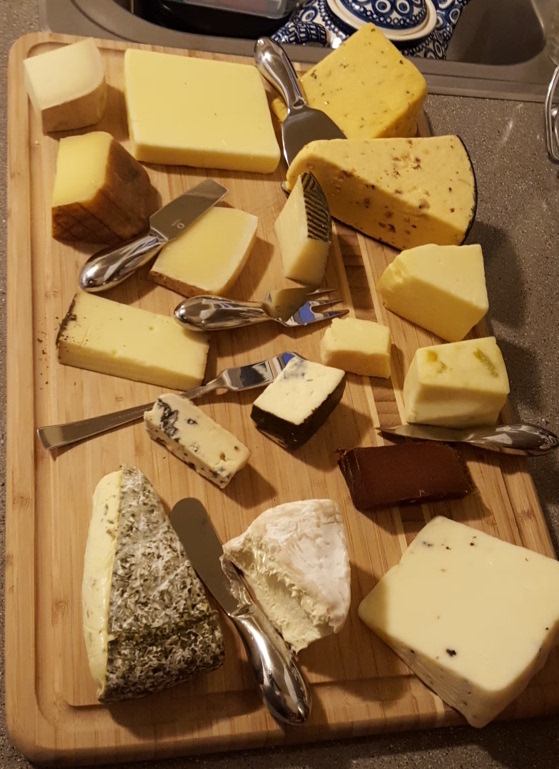 “The cheeses should be chosen to represent a balanced spectrum of cheese types and textures (ripened, unripened, washed rind, blue, hard, soft, semisoft), levels of flavor intensity (strong, gentle, sharp), and milk types (cow, sheep, goat)” (Jenkins, 26). While I, as a cheesemonger, will never tell you that you have to eat certain cheeses, I adhere to a similar concept of balance in selecting cheeses. Spoiler alert: now comes the fun stuff. You don’t necessarily want to have only soft cheeses, or only hard cheeses (unless you’re weird and hate soft cheeses; then you can have your damn three hard cheeses, but your cheesemonger will silently judge you, you party pooper)–unless, that is, you are doing a tasting of various cheddars or bries, for example. But that doesn’t really sound like a football-watching, meal-prepping Thanksgiving nosh, now does it? If you are feeding two to five people, and you’re also going to serve bread or crackers and some cured meats, olives, nuts, or fruits, three cheeses should get the job done. You might now be wondering how much cheese to get. The general rule is 1 to 1.5 ounces of cheese per person. Since everyone is going to be staving off their hunger until a pretty big feast, you can err on the side of 1 ounce instead of 1.5 ounces, or go big and just not be afraid to have leftovers. I always say that it’s better to have too much food than not enough, but then I did grow up attending family gatherings with my dad’s big Italian family, so hey. Now if you are feeding more than four or five people, you might want a few more cheeses. Say, four or five, even six if the crowd is one of hearty cheese lovers who aren’t afraid to spoil their supper. I would then recommend you get a brie or triple cream, a goat cheese, a blue cheese, a sharp cheddar and/or an aged gouda, and an Alpine and/or a hard sheep’s milk cheese. There is a lot of wiggle room in this equation depending on what people like or don’t like. Some people—like my boyfriend, tragically—categorically refuse to eat goat’s milk cheese. Others won’t eat blue cheese (and should then go sit in a corner, read what I had to say about blue cheese earlier on the blog, and think about how to mend their evil ways). In order to accommodate those people, you can get a couple of cheeses they will eat and one or two that they won’t eat, or you can go the safe route and get a crowd-friendly group of cheeses. Also keep in mind that not all cheeses are made using vegetarian rennet, so you might want to be mindful of your vegetarian guests’ needs. And most doctors recommend that pregnant women not eat cheeses made from raw milk. These are issues your cheesemonger can certainly help you with. When you are picking your cheeses, do not be afraid to ask your cheesemonger for a taste, especially if you aren’t sure about something she or he recommends, or if there’s something new you would like to add. As I mentioned earlier, you will also want to consider whether you want to serve your cheeses on crackers or bread, and if you want to pair your cheeses with olives, nuts, cured meats, pâtés or terrines, or fruit. Your cheesemonger can help give you some recommendations based on which cheeses you have chosen. Or you can just get what you like.